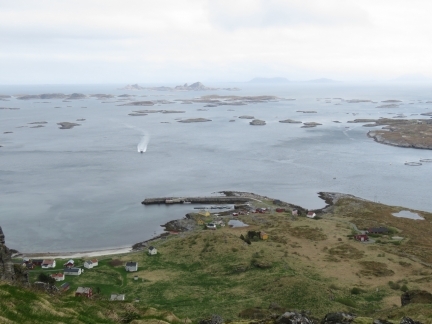 The dramatic Træna archipelago lies just four miles south of the Arctic Circle. Within the group, Sanna is perhaps the most spectacular, with several peaks jutting near-vertically up to 790-1000ft (240m-300m). 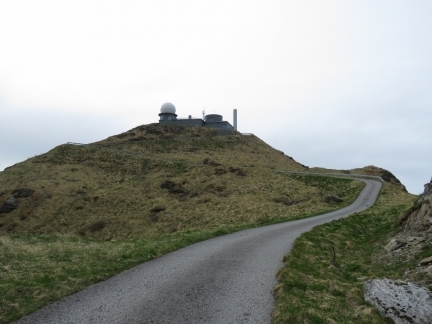 A pitch-dark 1650ft (500m) underground tunnel leads through the inside of one to a NATO radar station perched atop, with fabulous views to the surrounding islands. 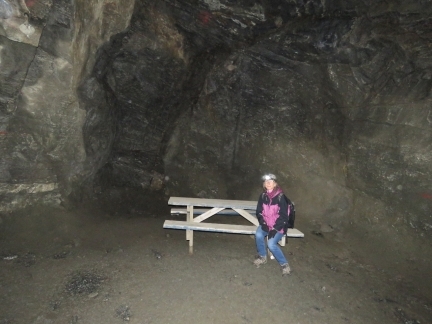 Another trail circles the island past huge Kirkehelleren Cave, one of the venues for the Træna Festival, a multi-day music concert held in July. 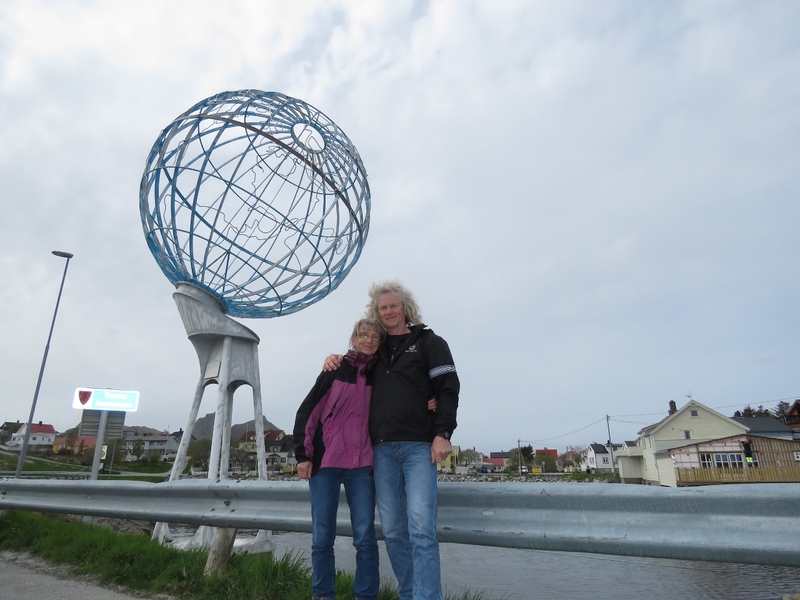 And since first seeing a picture of it months ago, we’d been looking forward to getting a picture of ourselves with the Arctic Circle monument in archipelago’s main town of Husøy. 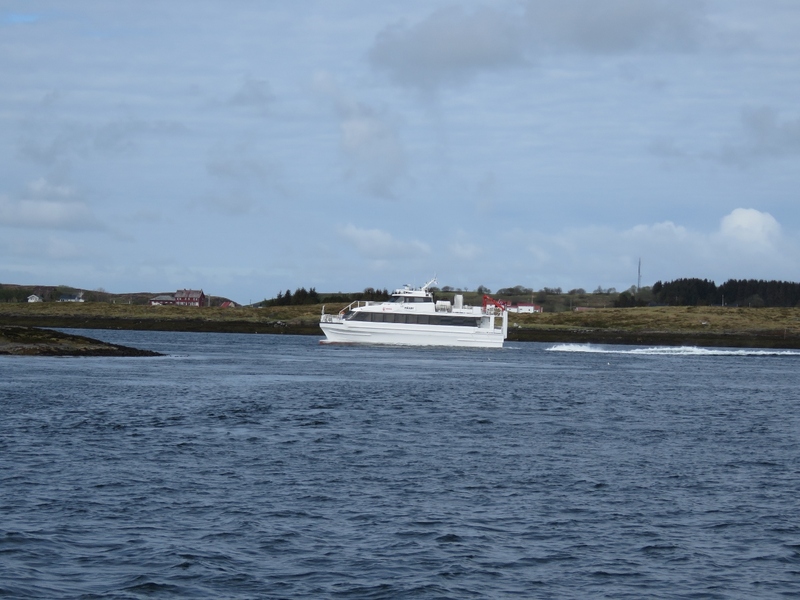 The fast ferry Vegtind en route to the island of Vega as we travel north from the island of Torget. Norway uses a wide variety of navigation markers cleverly designed to show the recommended path or paths through the countless coastal islets. Some markers have been in use since the Viking era. 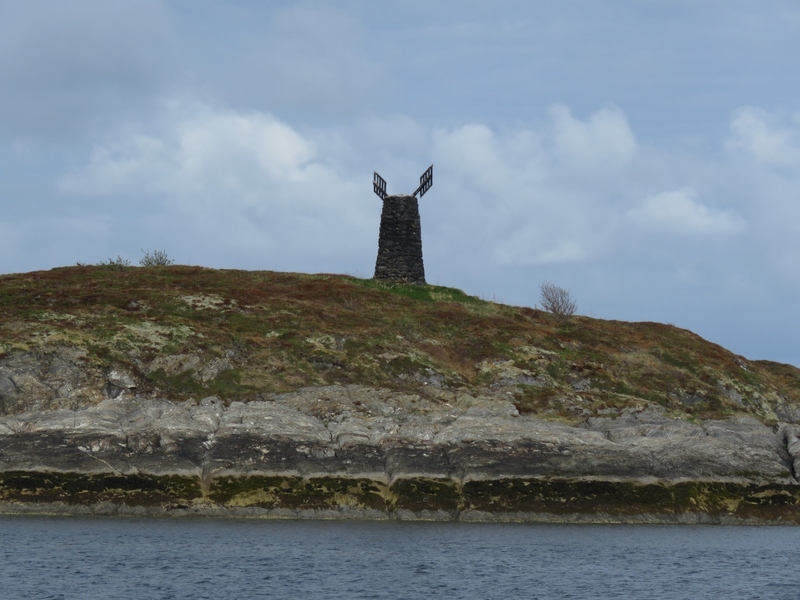 The topmark on this stone tower on Navaren island shows you can pass on either side of the island. 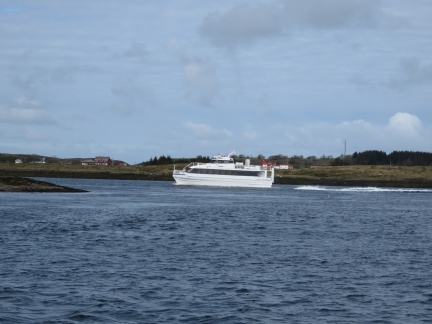 The fast ferry Mårøy heading to Brasøya. About to pass under another bridge, this one connecting the islands of Øksningan and Nord-Herøy. When we cruised Scotland, we carried a copy of Hamish Haswell-Smith’s The Scottish Islands. Hamish covers 168 individual Scottish islands and would likely consider Norway a real challenge to document with its countless islands. 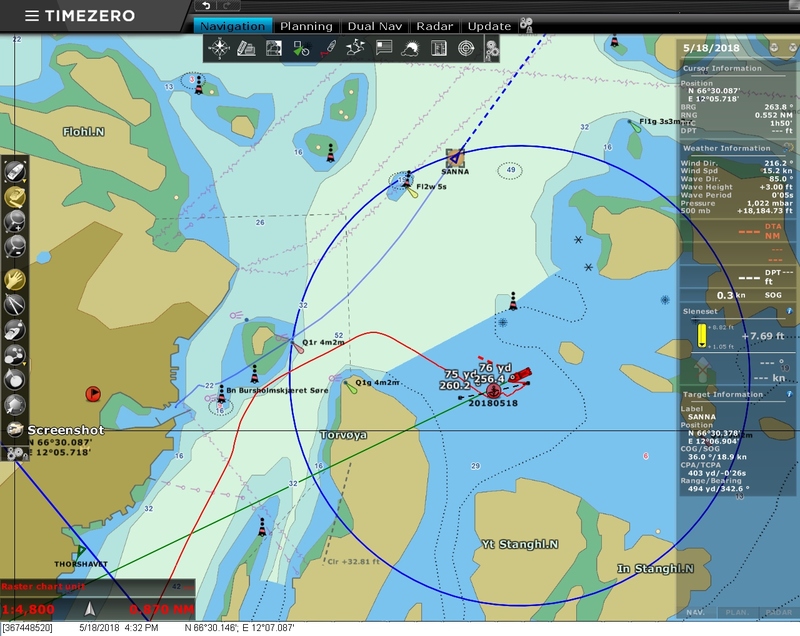 The only thing that might prevent complete overload is that he’s rather strict in his interpretation of what is and what is not an island, where the moment an island gets a bridge, Hamish says it’s no longer an island. 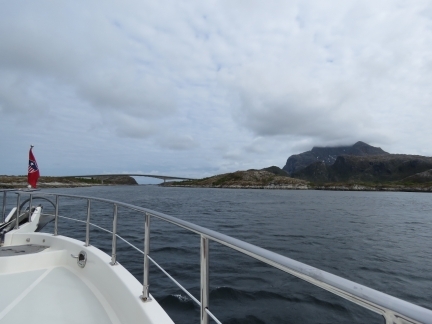 And Norway has a lot of bridges. These long runs are ideal for getting chores done such as vacuuming, doing laundry and making water. 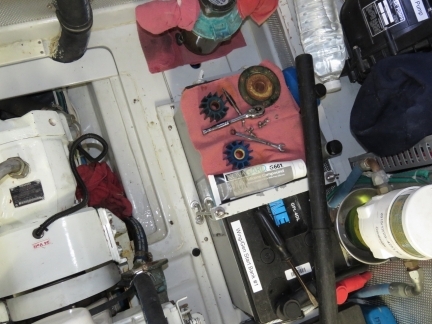 We continue to love that 240V inverter. 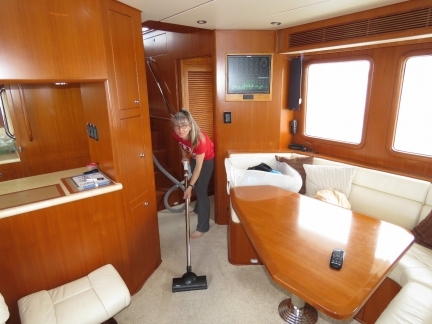 Otherwise we’d have to start the generator to do laundry and run the water maker. A small herd of deer on the island of Austøya. One fish boat towing another one. 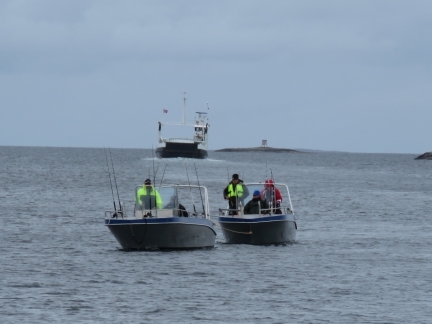 A fishing resort is nearby, so they likely don’t have far to go. 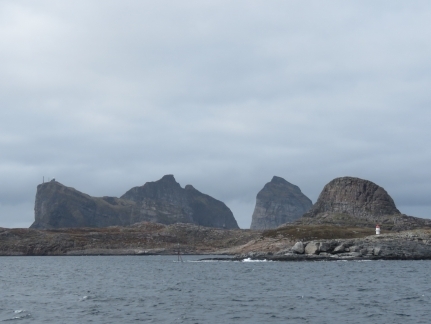 The new (left) and old lighthouses on Asvær. 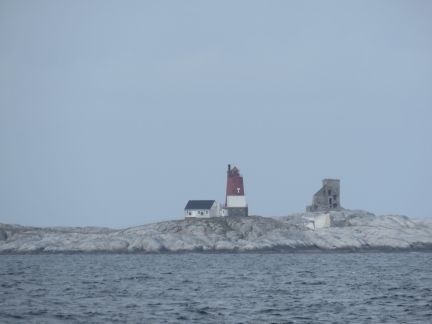 The old lighthouse, built in 1876, was destroyed by a storm and replaced in 1917. The prominent peak of Lovund about 6 miles to our north. 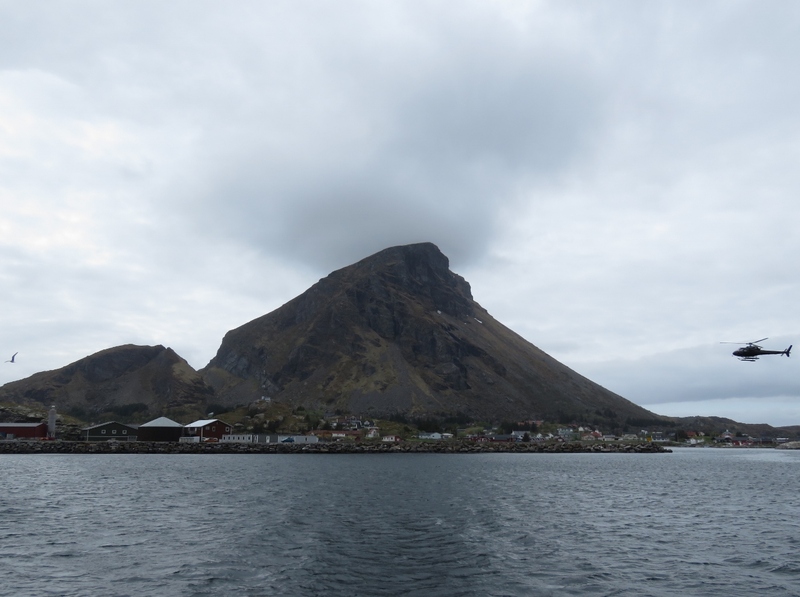 Helicopter landing at Lovund as we arrive. 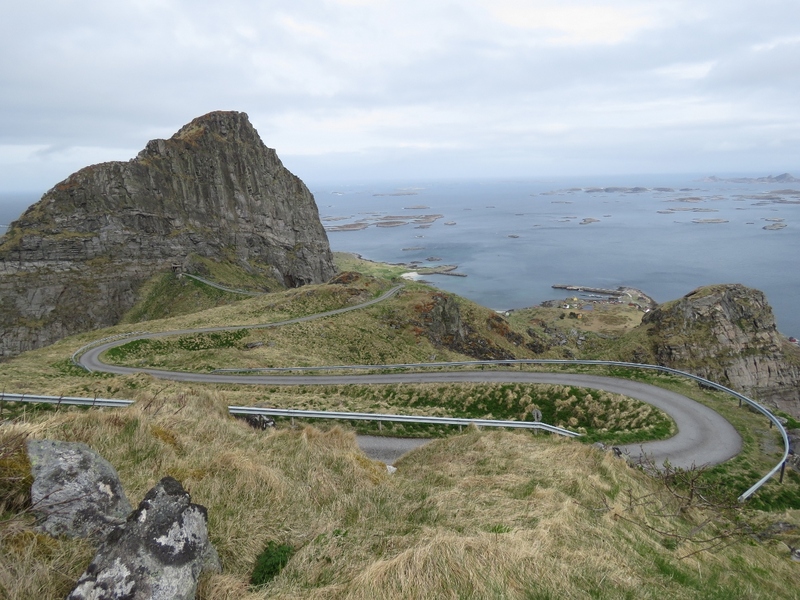 The puffin colony on Lovund is one of the largest in the world and the puffins return to the island every year on the same day, April 16th. 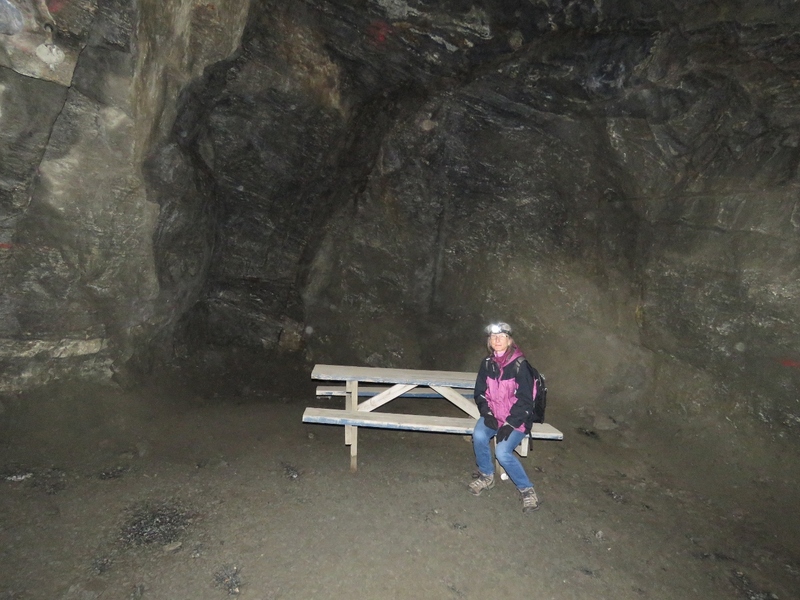 We were planning to anchor off to visit the colony, but couldn’t find a place with suitable protection and swing room. 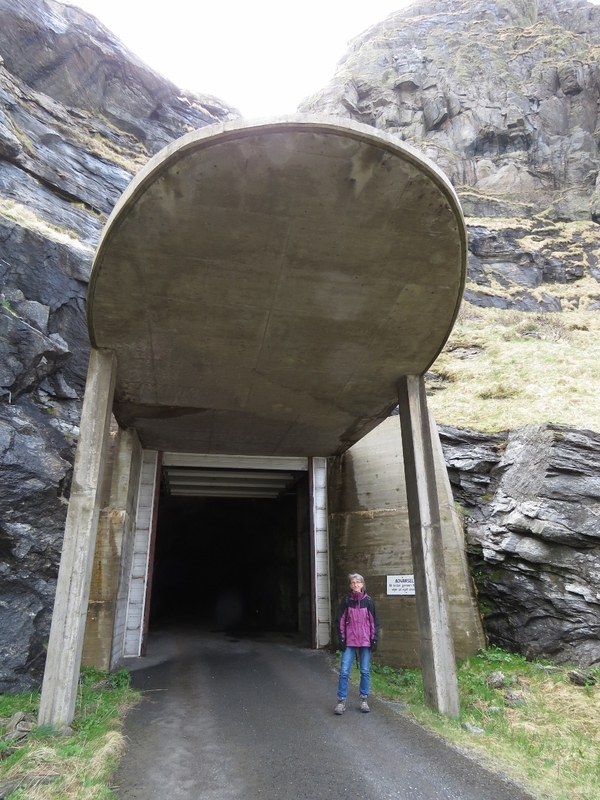 We didn’t feel like stopping in town on the dock, so continued on to Træna. 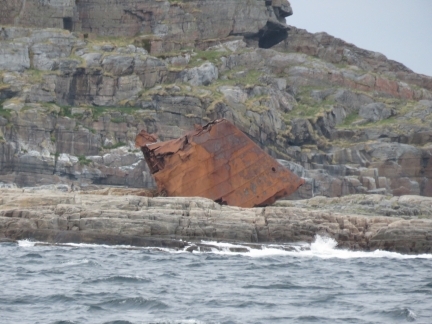 The bow portion of a fair-sized ship on Skarvskjæet off the south side of the Træna archipelago. It must have taken substantial wave force to carry it up on shore. 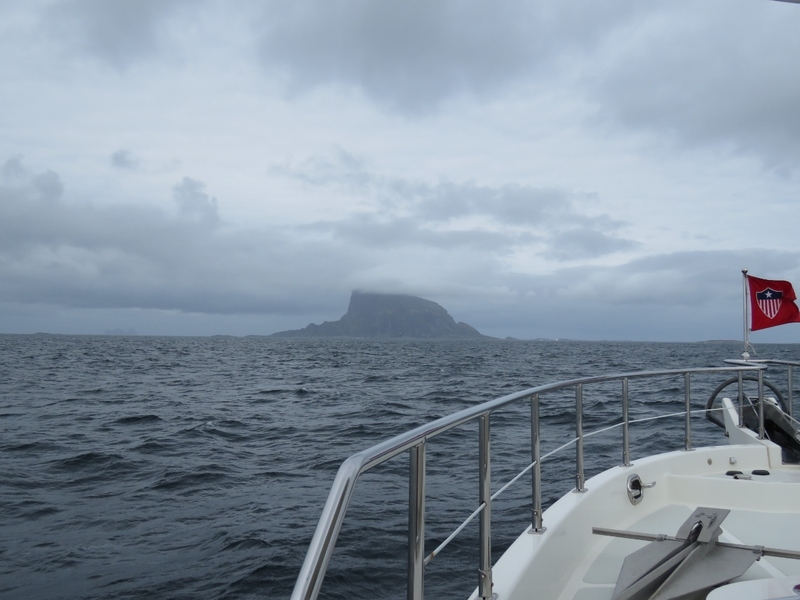 The islands of Hikelen in the foreground, with the dramatic peaks of Sanna behind, as we arrive into the Træna archipelago. 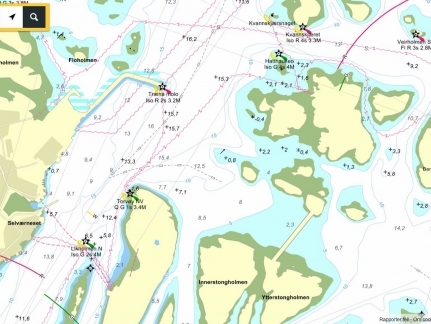 Our charts shows open water southeast of where we are anchored and an islet with a red light almost directly to our west. 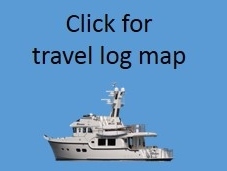 The newer online chart shows how much the area around us has changed. A breakwater has been built to our southwest, protecting our anchorage from ocean swell and a new breakwater has been installed to the northwest. 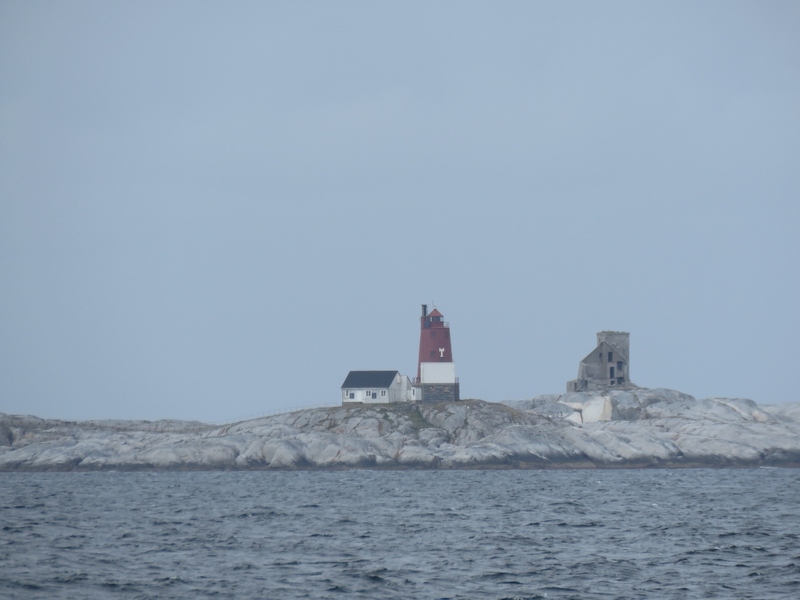 What’s even more surprising is the entire previously-marked island to our west has been removed. By coincidence, this is the third impellers of our three that we’ve changed in as many weeks. The hydrualics impeller needed changing the day we arrived into Norway and the generator impeller the next day. The wing impeller still looked perfect but it has been in use for nearly three years so we changed it. 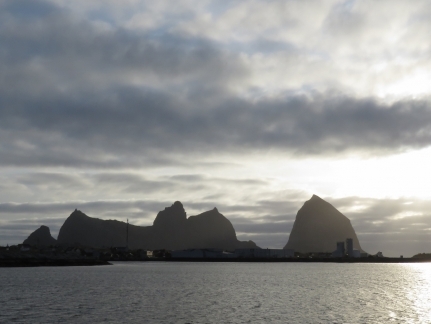 The view from our anchorage to the dramatic peaks on the island of Sanna, back-lit in the evening sun. 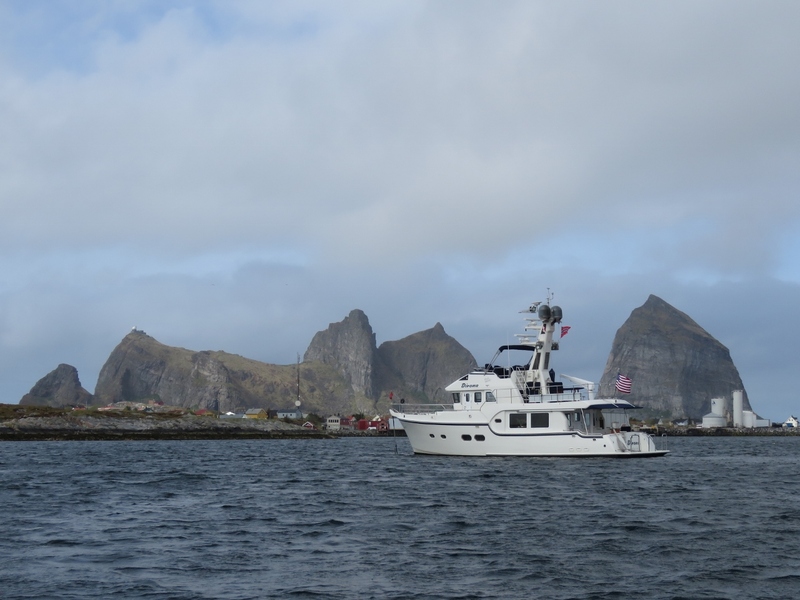 At anchor in the Træna Archipelago with the peaks of Sanna to our north. 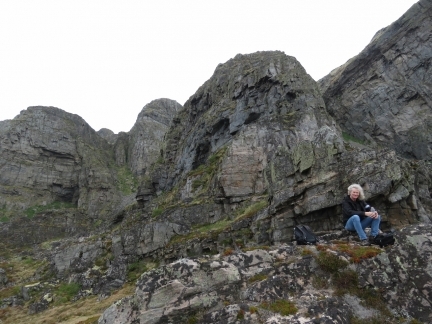 The white dome of a radar station that we plan to hike to this morning is just visible on Sanna’s southern peak, Kjølen, on the left. 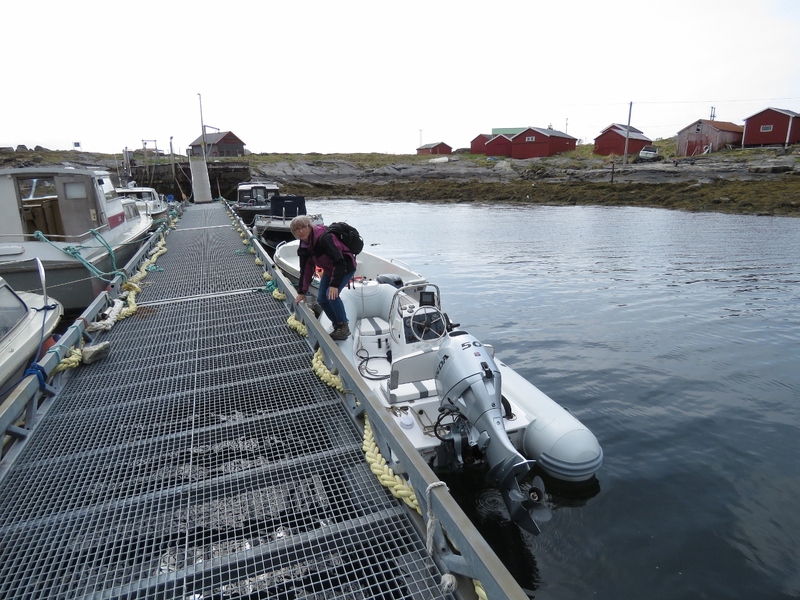 Landing the tender at the Sanna dock. The tiny village of Sanna had a population of six in 2001. 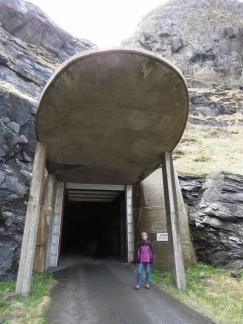 At the entrance to the (700m) truck-sized tunnel that leads up to the radar station atop Sanna’s southern peak, Kjølen. 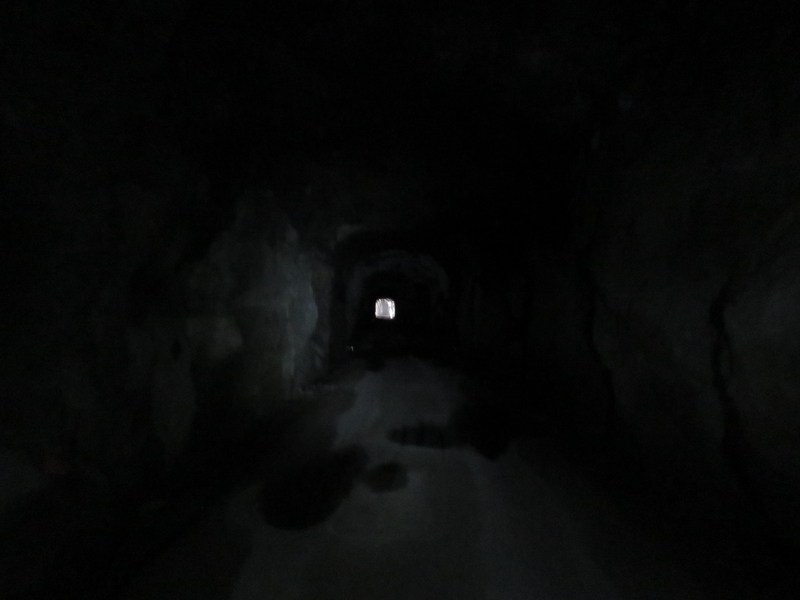 Partway through the tunnel. 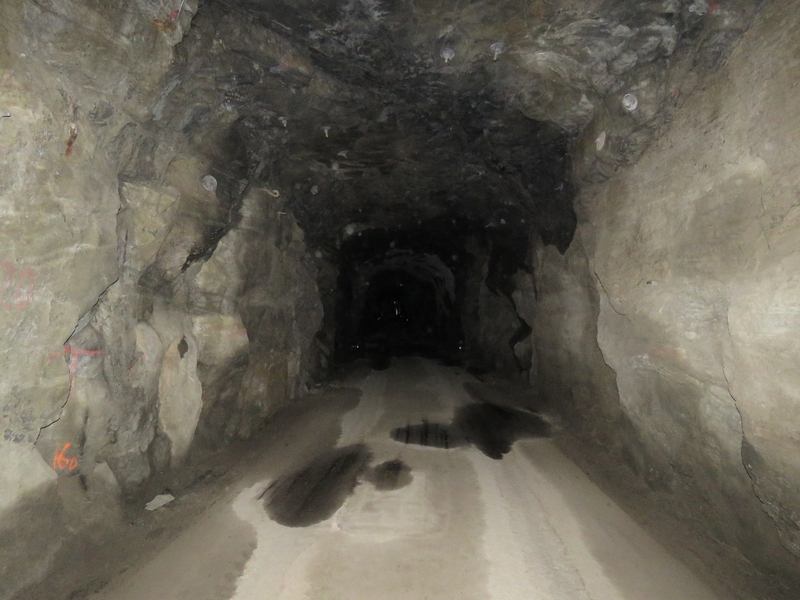 It’s pitch black inside for most of the way, but reflectors on the walls help mark the way, if you brought a flashlight. The tunnel rises reasonably steeply, with a picnic table partway up for a break. Our headlamps are ideal for walking in the very dark tunnel. 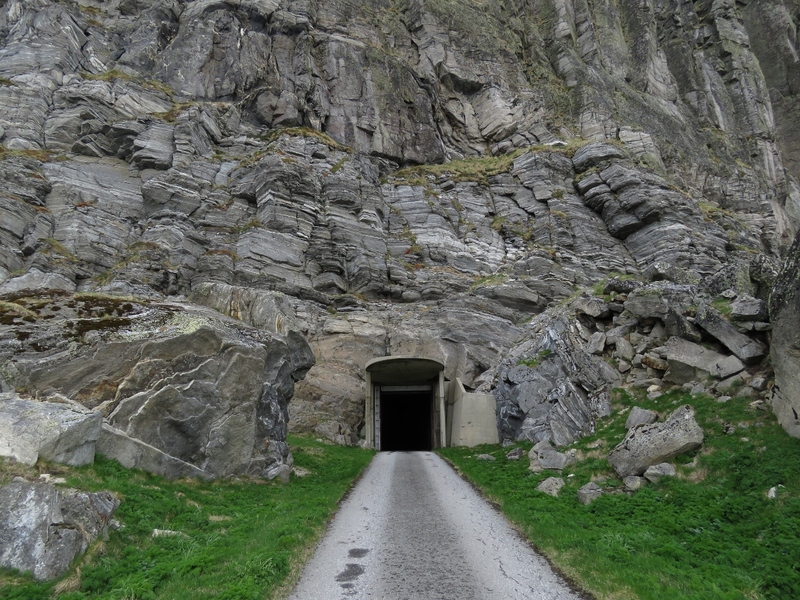 Looking back to tunnel exit—it was a fun and unique walk up. 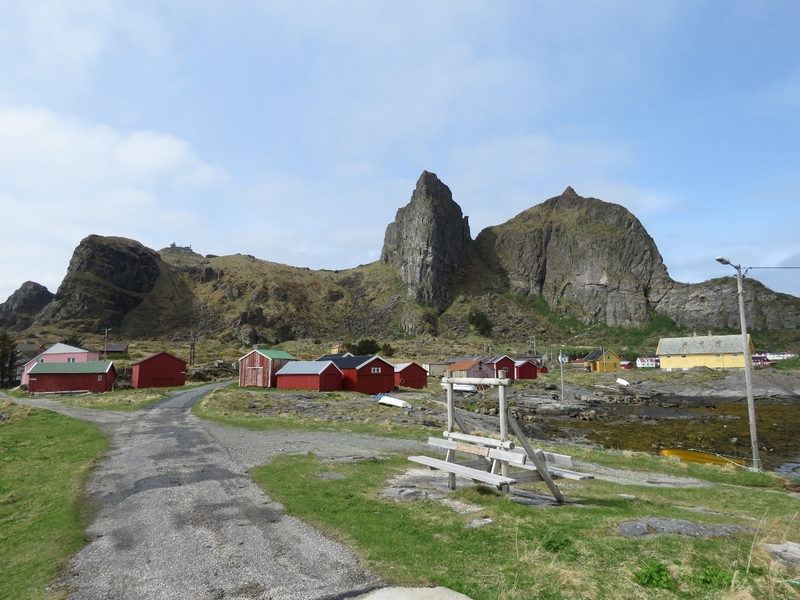 View to the Sanna village and dock from just outside the tunnel with a ferry arriving. This was originally a NATO radar station, and still has military signs not permitting photography near the fence. Looking down the road back to the tunnel exit from just below the radar station. Lunch below the radar station with an awesome view to Husøy. Close-up to the village on Husøy and our anchorage beyond. 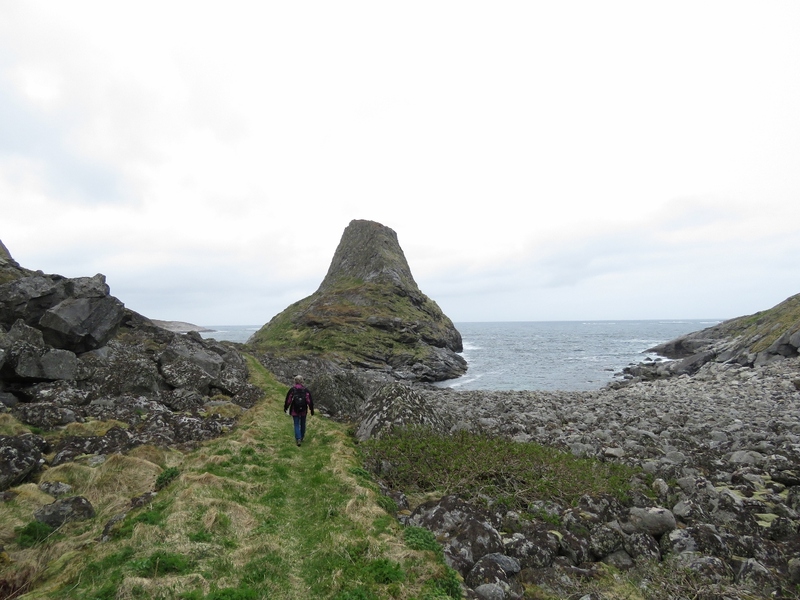 After returning back down the tunnel, we walked the coastal trail around the island. Looking up to the vertical cliffs along the west shore of Sanna. 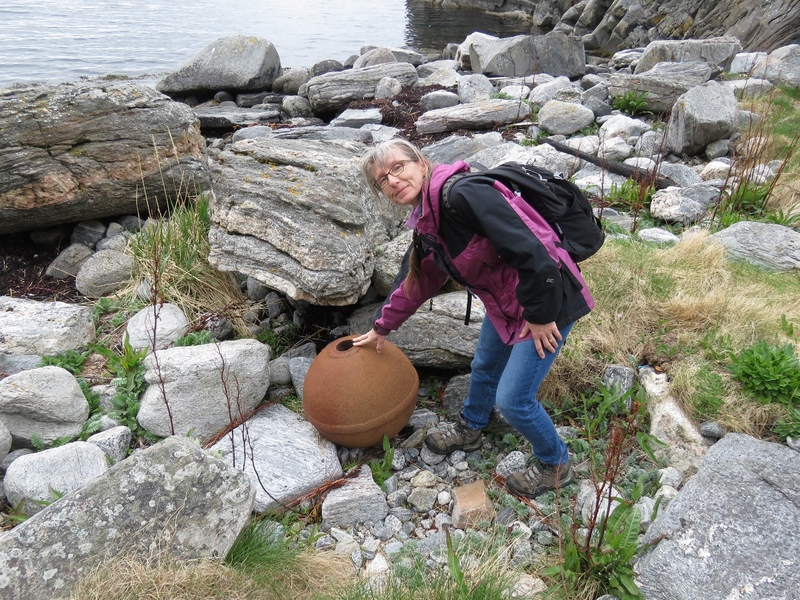 Lots of debris had washed up in the coves on the west side of Sanna, including several large metal fishing floats. 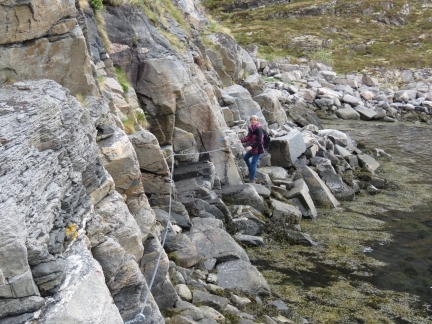 Climbing chains are strung along one portion of the trail to navigate around the head of a small bay. Taking a break below fantastic cliffs along the southwest corner of Sanna. Jennifer loves boardwalks. This one leads below Kjølen, the peak where the radar station is perched. 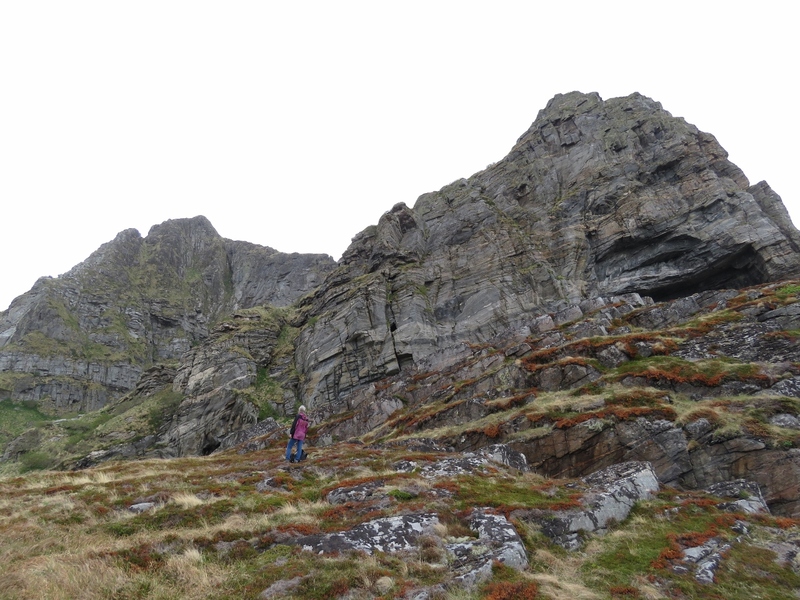 Part of the facility is just visible on the peak above. 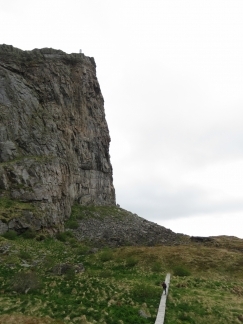 Jennifer is barely visible perched atop a rock inside Kirkehelleren Cave on the south side of Sanna. 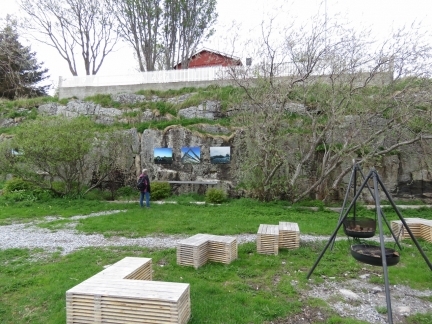 This is one of the venues for the Træna Festival, a multi-day music concert held in July. At the Arctic Circle Monument on Husøy. 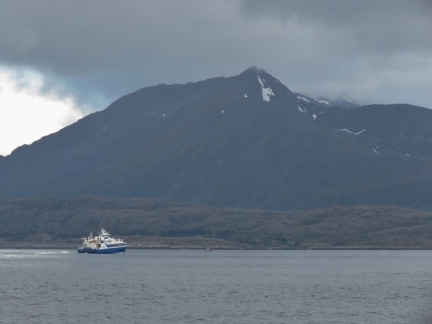 We’re less than four miles south of the Arctic Circle—our next anchorage will be north of it. 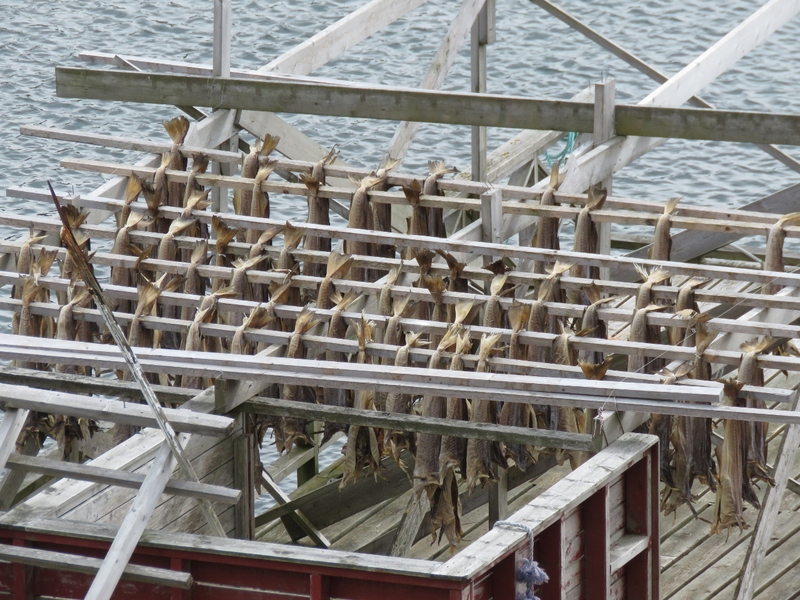 Cod drying on racks. 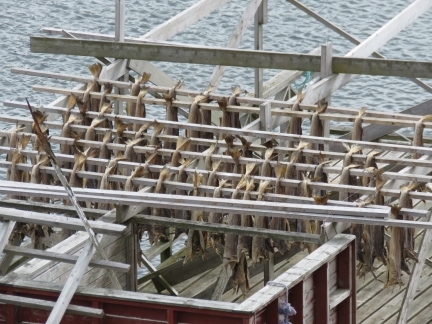 Dried cod is consumed locally and also is a major export. 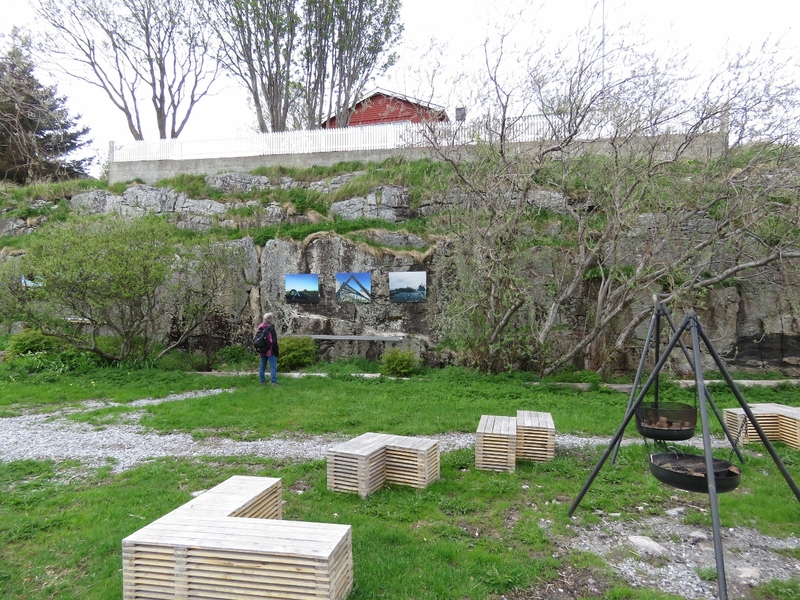 A beautiful outdoor gallery/park near the Træna visitor’s centre. The ferry Husøy arriving into, well, Husøy. We love anchorages with a view to ferry traffic. 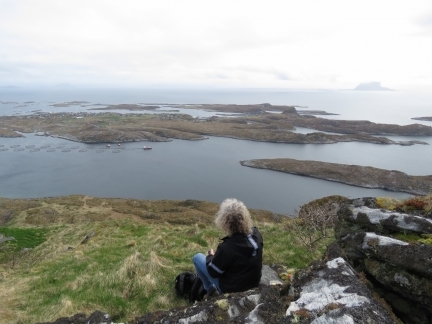 This one reminds us of Loch Maddy in Scotland’s Outer Hebrides. 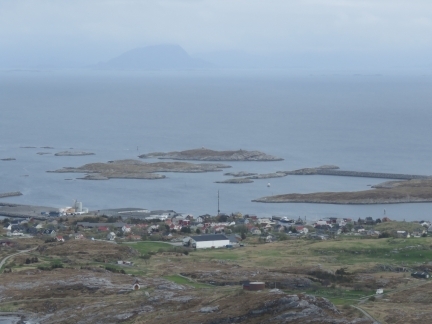 We can never get enough of the view to Sanna. 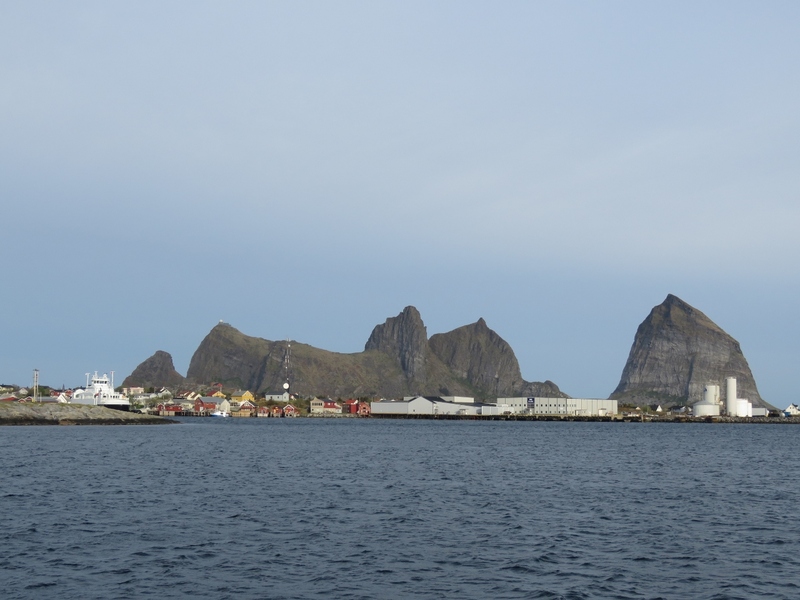 We’re expecting high winds for the next couple of days, so will stay put at Træna until conditions are calm enough for a passage to the Lofoten Islands. This is an excellent anchorage for the condtions—well-protected with good holding and plenty of swing room. In order to implement load shedding for the 2 Mastervolt chargers, back in Florida James cracked the Masterbus protocol (it’s a CANbus variant). This has worked well for years but its seems a bit fragile in that the chargers won’t accept Masterbus requests until fully powered up and we don’t like writing to the onboard NVRAM storage on every shed or unshed of chargers. 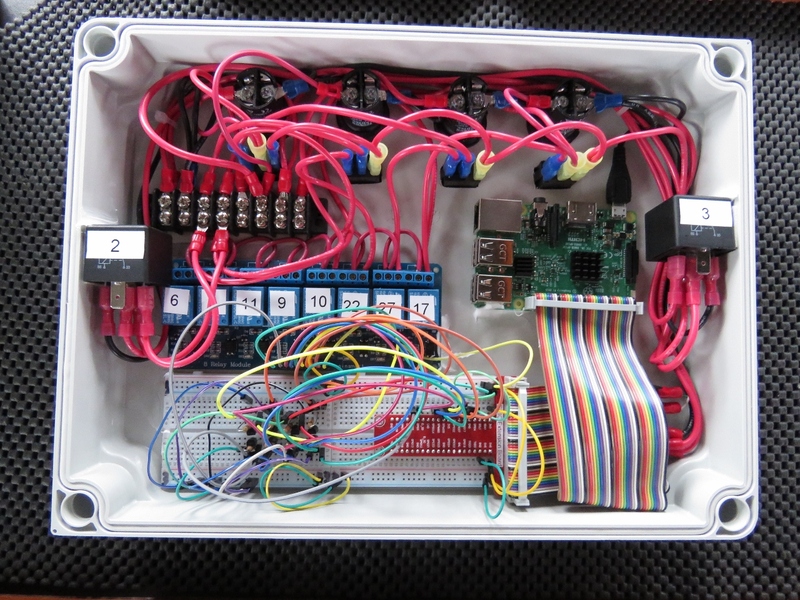 James decided to replace this system with a large contactor for each charger. 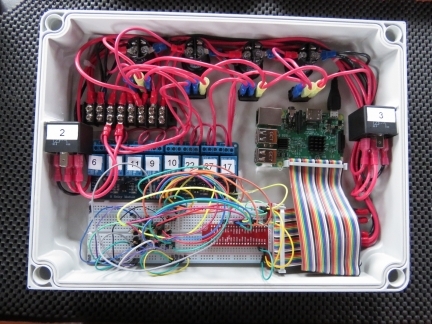 It’s simple, effective, and doesn’t change the charger configuration on each off/on cycle. However, like a lot of things that are “simple” once installed, putting these contactors in place requires lots of wiring work and the control system has to have a means to control them. James installed a Raspberry Pi to accept charger off and on commands. 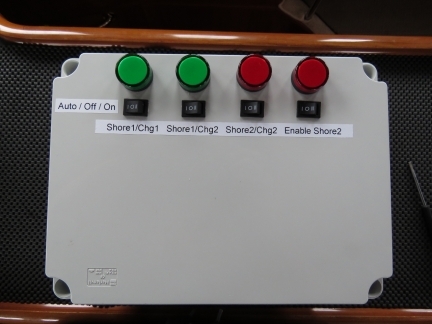 This by itself would be simple but, while there we also plan to add 8 channels of digital output and 16 channels of digital output for control projects in the Laz and Engine room area. Just to make sure this work doesn’t get done anytime soon, the Pi will also control a contactor controlling a second shore power connection. 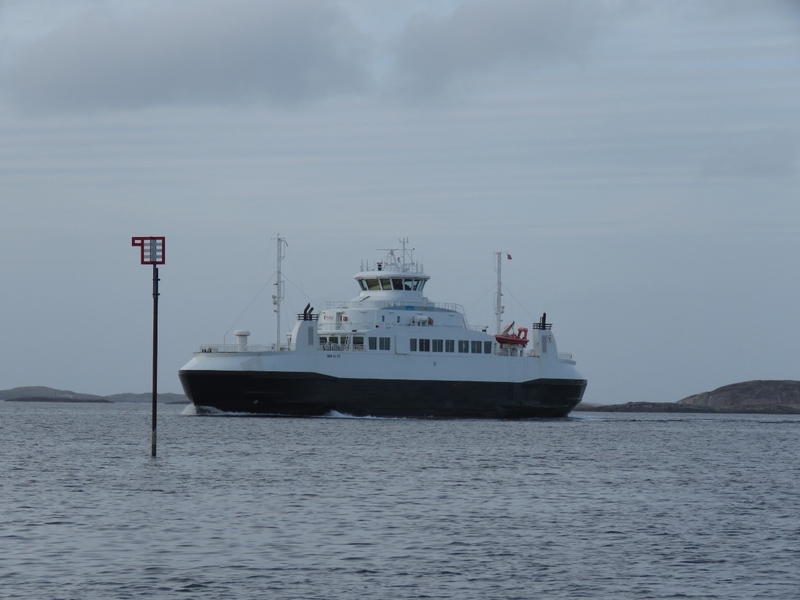 This will allow us to run both chargers off a single shore power as usual or to run the second charger off a second shore power connection. 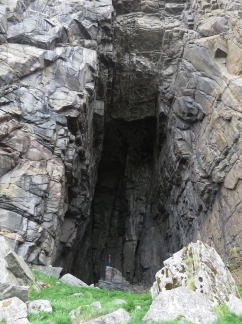 We’ll use this when only very low amperage shore power connections are available so we can use two connections of up to 16A each. 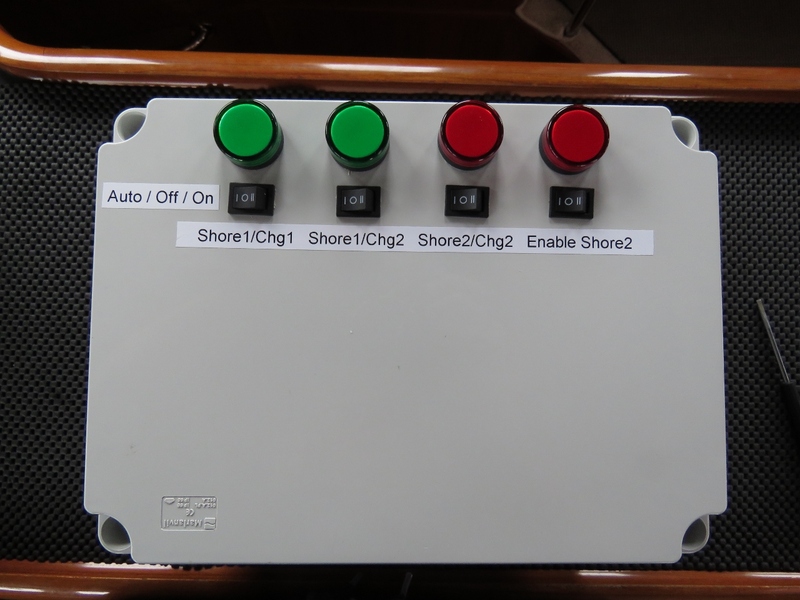 So, for example, if there were two 8A connections we could have one each charger to safely give the boat 16A of power without phase syncing or unsafely combining two shore power connections with the risk of back feed. It’ll take quite a few rain days before these projects are all up and running. 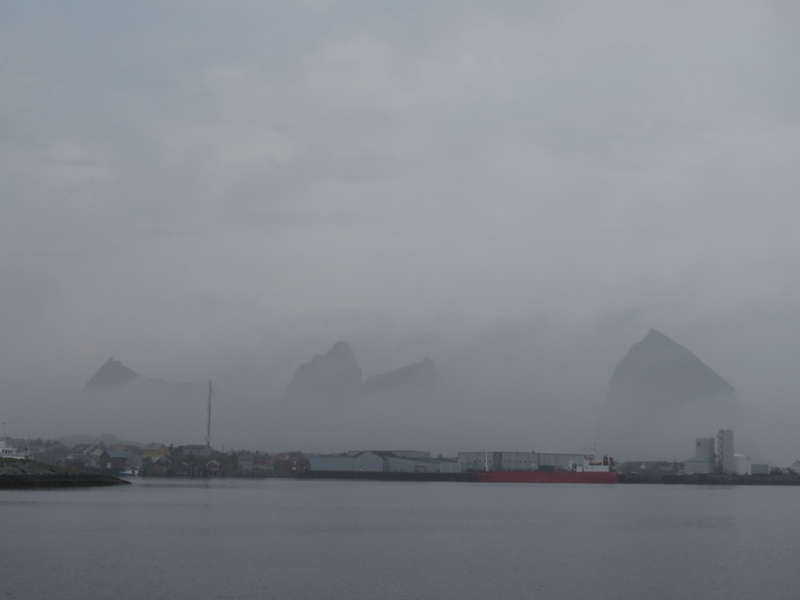 The peaks of Sanna almost invisible in the fog. 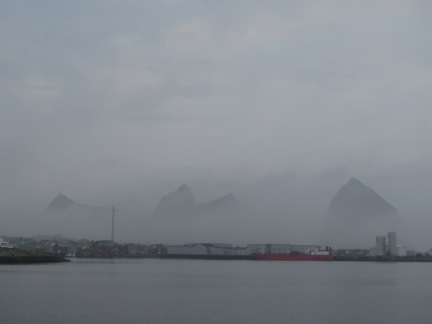 They eventually disappeared entirely. 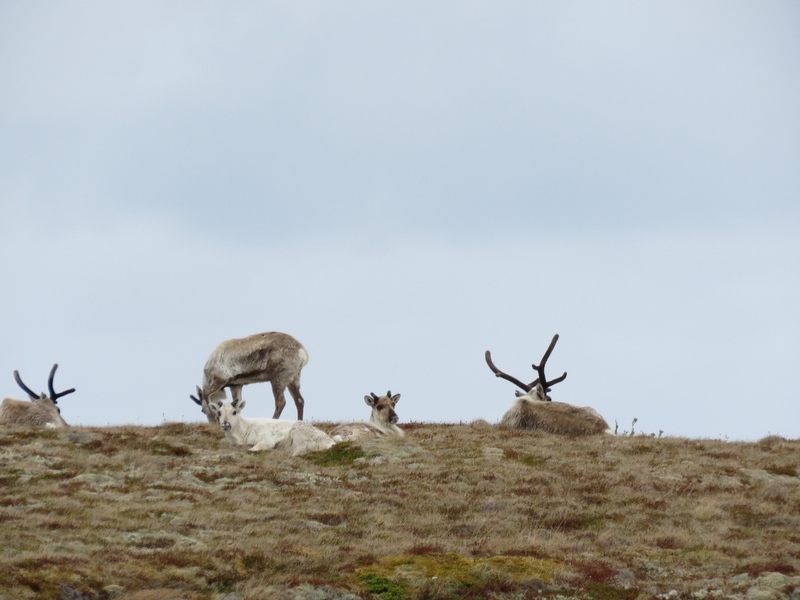 Wonderful read and photo’s JJ. I’ve been reading in a national publication that Puffins are on the decline in general, and are in the top eight on the species list for global extinction within a 100yrs. They are Jennifer’s favorite bird so we hope that situations turns around soon. We love ’em!